As SULLY ERNA, founder, vocalist, guitarist and songwriter for the multi-platinum rock band GODSMACK, gets ready to release his new solo album Hometown Life--due out Friday, September 30 via BMG--he has premiered a new song and lyric video "Different Kind Of Tears". For the clip, SULLY puts the pen to the page handwriting all the lyrics to the countrified track, which offers a glimpse of what's to come on Hometown Life. Composed by SULLY on piano and acoustic guitar and produced in his New Hampshire studio, the 10 songs on Hometown Life are a powerful mix of rock and country while even including orchestral overtones. "Honestly, this is one of my favorite songs on the album. I had the pleasure of writing this track with songwriter/producer Zac Maloy (Tim McGraw, Carrie Underwood)," explains SULLY. "I love the melodies and the chorus because of the vulnerability. It's one of those things, when we're in pain, we don't think anyone can understand how bad we hurt, how deep it goes. I try to write generalized enough for people to be able to translate these lyrics and thoughts to their own lives, help them through their tough times. Music is a gift. It's there to help us heal." 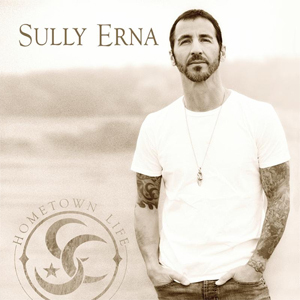 Listen to the new song, watch and share the lyric video for "Different Kind Of Tears", from SULLY ERNA's new solo album Hometown Life, below. A personal, confessional, raw work which takes yet another stylistic left-hand turn from the music he has created as front man for the multi-platinum rock band GODSMACK, Hometown Life offers a wide-ranging glimpse of SULLY's eclectic musical tastes--from the singer-songwriter Billy Joel/Bruce Springsteen narratives of the title track and the bossanova touch of "Take All Of Me", to the breezy island feel of "Your Own Drum", the finger-snapping Motown bass lines of the bluesy "Turn It Up", the country flavors of "Different Kind Of Tears" and the wide-screen canvas of mini-symphonies "Blue Skies" and "Forever My Infinity". All of them are tied together with SULLY's unflinching view of the emotional roller-coaster of his life, drawing us into an intimate space. Hometown Life explores ERNA's diverse musical touchstones from James Bay, new country favorites like Chris Stapleton and Brantley Gilbert to soul legends Ray Charles, Etta James and Amy Winehouse.